Strange enough the searing headache I carried the whole day today Friday only pestered me right after the Simple Minds concert featuring OMD (Orchestral Maneuvers in the Dark), all eighties flick, last night. Precisely after the concert finished in Heineken Music Hall in Amsterdam Arena my head throbbed. UGH. Was it was the noodles I ate? The red wine I drank? Or the two glasses of Heineken beer I had during the concert? Or maybe it could be the work stress added into all these. Hmm. Well, it’s not pleasant at all going to bed with a headache and waking up with it, moreover bringing it all the way to work the next day. During the thirty-minute short break after the OMD introduction. A few years ago Dutchman and I were also here for the Simple Minds concert and we were standing right by the stage. Last night we were by the bleachers, far but we had a great view, I think. Simple Minds here in action with the play of lights. The show started at 8PM and we left the music hall 1130PM. The sound quality of Heineken Music Hall is really good... videos below! OMD's once very very popular song -- 'Enola Gay'... ah, those were the days! OMD, New Order, Depeche Mode, they began the new era of music, the synthesizers rage that has now morphed into techno, trance and house music. Simple Minds' -- 'Don't You Forget About Me', another big hit back then in the eighties. This song just never dies, classic. Another of Simple Minds' - 'New Gold Dream', a fast number and love the show of lights here, this is the end part. The concert was sold out, didn't realize there are still many Simple Minds fans out there. Did you know that back in the eighties they were neck and neck with U2? In the hallways of the music hall I was squeezing my little self between giant Dutch people. Why is it that every time I am only seeing shoulders!? Answer: I am too short in this country; I swear I never felt like a midget anywhere else except here. Glad I am not one of those claustrophobic types or else I will totally freak out. Jim Kerr is getting older, and well, heavier too. He didn’t dare take out his jacket during the whole show even if it was blazing hot on stage whilst sweating like he just did a hundred kilometer run. I bet he is hiding something inside his clothes, which many of us can relate, lol. And Andy McCluskey, oh dear his wacky dancing on the stage brought me back to the eighties! I’m so so old ha-ha. It’s also interesting to notice that the audience is older, from late thirties to fifties. There was a group of dark looking guys smoking as if its the most normal thing to do. Argh, I was so tempted to go down the bleachers and give them a lecture. Asociale mensen. This type of behaviour, the total neglect of other people and the rules really irks me to bits. The music hall is no smoking alright. All in all, the concert was nice except the searing headache after. Last month Dutchman and I went with the Dutch family on a weekend hike in Bruggelen near Apeldoorn (Gelderland provincie) in the eastern part of the Netherlands. We first had some tea, coffee and tart in a restaurant where we parked the cars. It was a beautiful day; dry, not so cold, very little wind and the sun is up. A totally different day compared to the day before that was raining cats and dogs, I was already a bit worried that the hike will be cancelled but the weather forecast promised for a great day on Sunday and it did! Progressing with the hike here, the forest lays quietly on a bed of bright red orange dried leaves, so beautiful! There were many needle-like trees in Bruggelen forest. A button red mushroom with white spots, I tried recollecting where I have seen red mushrooms with white spots, something like a cartoon show, then I just realized it was 'Super Mario' (Mario Brothers) and the mushroom kingdom, haha. I used to play the video game Super Mario like crazy in the early eighties. Here is another red mushroom with lesser white spots that we spotted. The pole in the middle foto is part of a vast network of colour-coded directions in the forest. Next pole shows that we should watch out for dogs and horses as we are walking on their trails. And good enough, we saw a couple of people on horses and this one is the most impressive, a little horse carriage, they were going so fast! We also came upon a group, a Dog club walking their dogs in the forest. Almost there! I love the yellow colours of the plants and trees in this foto and the greyish blue dramatic backdrop of the skies. Somehow we lost our tracks in the forest but found our way after asking a couple of people along the way. The three-hour hike became an almost five-hour hike! Although we stopped and rested in between, we were tired from the long hours of walking. I have good physical condition so I’m not really complaining. I love nature walks, especially during autumn when forests are most beautiful. Looking forward to the next walk! 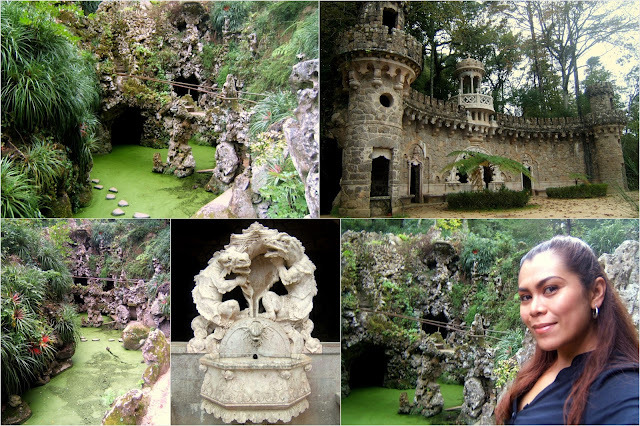 Oh boy, I was not really prepared to see all the grandeur and fantasy fairy-tale like parks in Sintra. I thought I will be seeing castles, palaces, stately mansions and that’s it, but little did I know that these estates have amazing out-of-this-world gardens—no that would be too modest—they have parks, HUGE parks! 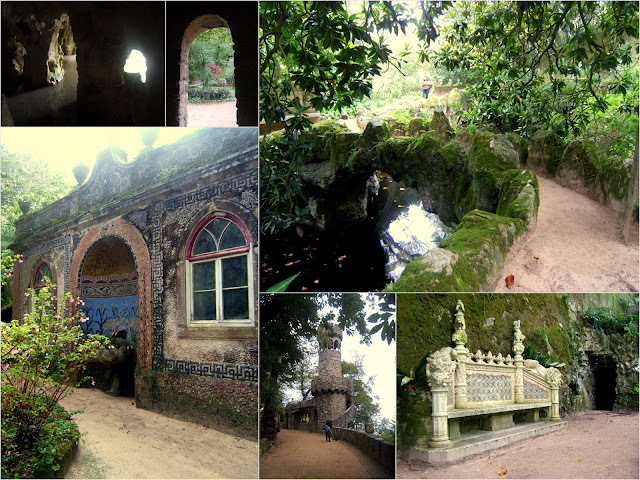 Sintra has a potpourri of nature and man-made parks that is so startlingly familiar—in my dreams, lol. It’s like those parks in Alice in Wonderland or Wizard of Oz but the stage pushed back to the medieval ages and with the abundance of nature, that’s what the parks are like in Sintra. Well, what can I say, it really felt like I was in a different world... that I am peeking into a fantasy world. I guess when you are filthy rich you can afford to let your imagination run wild and make it come true. Like Michael Jackson (not a fan of his music though), he had Neverland. Just a ten-minute walk from Sintra town center, this luxurious four-hectare medieval-like estate is like a child’s fantasy dream come true. The Quinta da Regaleira is an achievement of mythical dreams of the owner, António Augusto Carvalho Monteiro and his Italian architect, Luigi Manini. This must be the 'Threshold of the Gods' or 'Ibis Fountain'. Beautiful fountains with chimerical creatures in the lavish park. The colourful flower tile work detail on the royal bench in Manueline-Renaissance style located beside the cave. Here is a lake with a grotto and a stone bridge, forgot the name but this is near the threshold of the gods. The romantic palace is a remarkable concoction of Gothic, Renaissance, Roman and Manueline architecture styles and the ultra extravagant nature park includes a lagoon, caves, wells, grottos, bridges, a waterfall, mini-parks, hidden winding paths, a chapel, several towers, mini-castles, a tea house and a collection of exquisite Manueline inspired park accessories such as benches, fountains, gates and other constructions. I would not be surprised if António Augusto Carvalho Monteiro, the millionaire who built this romantic, utopian and magical estate 100 years ago was probably under the influence of his bizarre mythological cultic fantasies. It’s said that he was into alchemy, masonry, the occult and the templar knights. Right, so that figures. This is the entrance of the park. 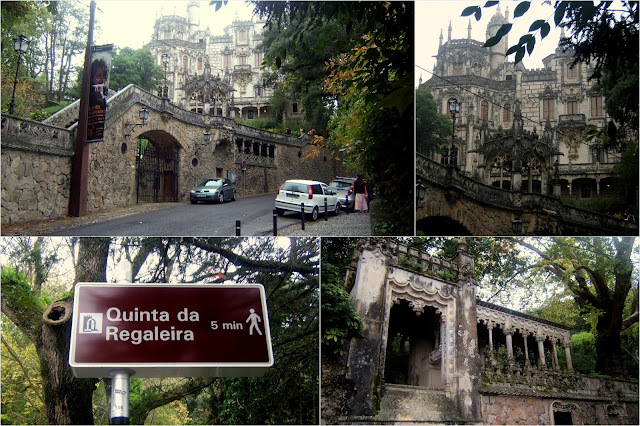 Really—and this is not an exaggeration, Quinta da Regaleira, the palace and the park is simply astounding. My mouth fell open upon realizing that it’s a real residence with a four-hectare fantasy fairy-tale park. Someone used to live (whimsically) here before! An example of Neo-Classical architecture in Sintra is the Seteais Palace built during the late 1700’s for the Dutch consul Daniel Gildemeester. 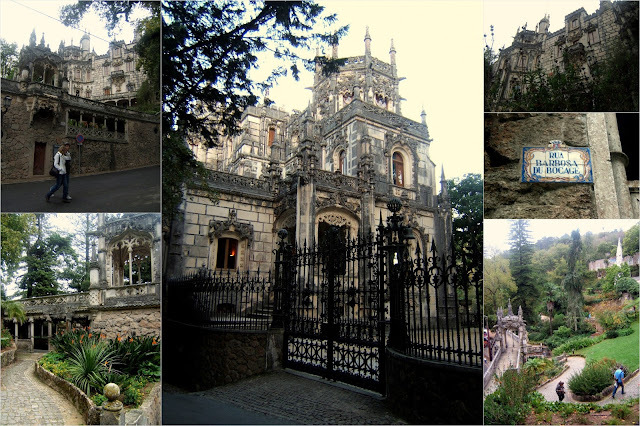 Seteais Palace is less than a five-minute walk from Quinta de Regaleira. The Seteais Palace was built by a Dutch man in the 1700's. It is now a luxury hotel. The neo-classical arch is the focal point of the palace has the effigies of Prince John VI and Princes Carlota. A well trimmed labyrinth garden. The monumental arch in the middle of the palace really stands out. It has the imperial crown perched on it with an effigy of the monarchs, Prince John VI and Princes Carlota and a Latin inscription below it, exclusively made for the royal couple as a tribute when they visited the estate sometime in the early 1800’s. The palace is now a luxury hotel and a restaurant under Tivoli Hotels (I stayed with the sister hotel in the center of Sintra). When the news came out that Belgian Prime Minister, Herman van Rompuy was elected by EU leaders during a closed dinner session tonight as the first European Union President, it didn't came as a surprise. 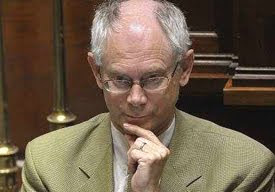 Herman van Rompuy reminds me of Merlin in the Arthurian legend. In this foto he looks like he has a sinister plan in mind, hehe. He actually has a sense of humor, very poetic and an avid blogger as well! Check out his haikus and his blog, but they are all in Dutch. Isn't it cool to have a president who is a real blogger? Van Rompuy has been the front runner candidate for the EU Presidency, with the charming Tony Blair from the UK, Harry "Balkenende" Potter of the Netherlands and VVF iron lady of Latvia as other favoured candidates. Obviously, van Rompuy coming from a "centre-right" political party in a centre-right filled EU parliament, with France and Germany backing him up (hint: both countries swearing against Turkey joining the EU) what else can we expect for a vote turnout? Left party leader Tony Blair wouldn't stand a chance in a right wing crowd, although Harry "Balkenende" Potter would probably have, being also centre-right. During the press conference, it was cool to see President Herman van Rompuy address the public in a truly European fashion, in three languages, fluently: French, English and in his native tongue, Dutch. Now the question is... who is going to lead (divided) Belgium now? On other news, it is so bloody warm for the season. On my last evening in Sintra, I went to the Alcobaca Restaurante for dinner. I was hankering for a locally produced aperitif. The waiter suggested that I take a glass of Moscatel from the region, so I did. 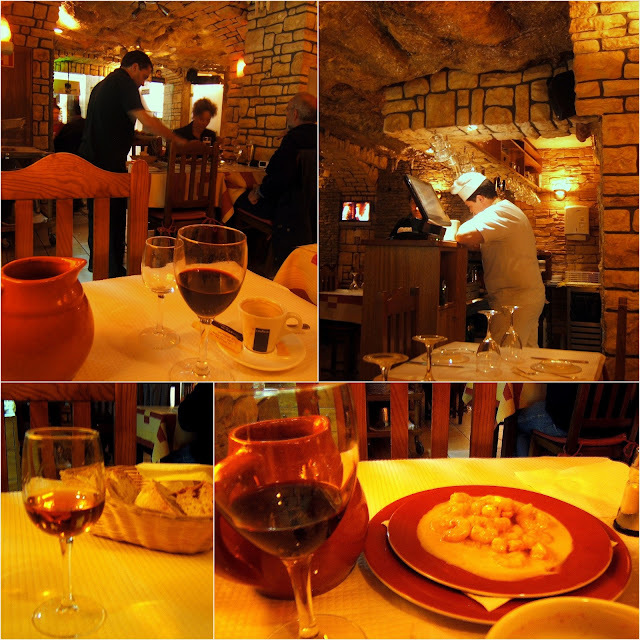 The restaurant was in this cave-like setting. My dinner was gambas on cream sauce which was a house specialty and came in highly recommended. I did not want to have white wine to go with my seafood, which normally is the choice, so the waiter told me that half a liter of Colares red wine would be a good alternative. As you can see the pattern now, there’s more booze than the actual dinner, haha! Nevertheless, I can handle myself very well. I don’t really go overboard as I know my limits. I am just a curious cat who wants to try everything. After dinner, I went back to my hotel and Ginja (also called as ginjinha) was waiting for me. Ginja is a Portuguese alcoholic drink made from Morello cherries and it tastes like rum. They are best drank with little chocolate cups. Now, I accidentally found Ginja while going around the little village. 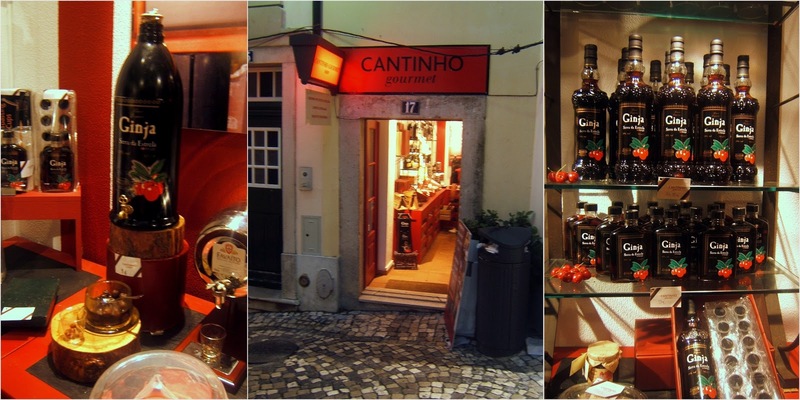 Catinho gourmet shop had a tasting corner and obviously I was curious as it is a locally produced product. I tried the Ginja in a chocolate cup but did not like the combination of alcohol and chocolates, so I ditched the chocolate cups and only bought the alcohol. So that is how I ended up with a little bottle of Ginja in my hotel room. That night I slept like a baby until the alcohol left my system and I woke up at 2 in the morning craving for water.